There are some things you should expect from Aruba: endless sunshine, white sandy beaches and fresh seafood. The desert island, located outside the hurricane belt, boasts almost daily sunshine and warm breezes, meaning there’s rarely a day you’ll be forced to skip your date with the beach – or your beachside breakfast, lunch or dinner. If there is a morning sprinkle, it’s usually more of a joke, a welcome break from endless sunshine and heat, locals might say, and helpful for growing lettuce and dragon fruit. I’ve decided on Bugaloe (don’t tell Ricardo!). Located on a quay jutting into the water just south of the Hilton on Aruba’s West Coast, the bar and grill offers a free salsa class (the dance, not the hot sauce – though you should try the local Pica di Papaya) taught by ArubaSalsa. When I arrive, the bar is packed with pre- and post-dinner couples and groups and the class is underway. I settle in at a long, wooden bench with a view (of the dancing and the ocean), but before long I’m swept up into a dance by an ArubaSalsa instructor. But it’s not salsa. It’s bachata. It turns out it’s not so hard. To the right: one-two-three-hip! To the left: one-two-three-hip! Turn-turn-turn-hip. And it’s a lot slower than salsa, which, with all its spins would make an oven sweat in this warm evening air. Hours of salsa, bachata, merengue and kizomba (think African tango) later, I’ve made a plan to join the ArubaSalsa team on Saturday night at South Beach, the outdoor bar and dance floor next to the Hard Rock Cafe. That’s when the island’s three main dance schools come together weekly with locals and tourists to dance to live music – including reggaeton, so you don’t need a partner or salsa expertise. Dancing starts after 10:30 p.m., so for those who need a little liquid courage, there’s time for a pre-dancing Cashew Fusion cocktail at Ike’s Bistro or a Cadushi at The Ritz-Carlton’s lobby bar to loosen your hips. Walking back from Bugaloe along the beach to my home-away-from-home at the exquisite Blue Residences, the still-warm sand is exfoliating my tired toes, which reminds me of a few days earlier, when I was early for my interview with Chef Joyce of Yemanja Restaurant in downtown Oranjestad. With twenty minutes to kill, I’d noticed Cosecha next door, a non-profit shop that only opened a few years ago, selling paintings, jewelry, clothing and crafts all made by local artists. I’d stopped in to see if Ashlin Ahlip of Tangerine has released his line of Portuguese tile prints for his “We the Boat People” tote bags yet, when to the left of his gorgeous bags, tucked into a corner of the traditional cunucu-style house, I’d noticed a Christmas tree ornament – sparkling silver bows wrapped around a see-through cube filled with sand. Turning it over in my hand, I’d watched the trapped sand spill over the inside walls of the ornament. It was far from Christmas, but there was something about bringing a tiny bit of Aruba home with me (combined with idea of sand that will never sneak between my toes) that made me love the decoration. The fact that the purchase came with a description card of the local artist who made the ornament was the icing on the cake. But leaving the shop, I wasn’t thinking about cake; I was thinking about sorbet – specifically, the home-made passion fruit sorbet that I had a few nights earlier at next-door Yemanja. It’s fair game for omnivores and vegans alike, which I took note of because vegan cuisine, much like the island’s ubiquitous sand – from beaches, to my toes, to Christmas decorations – is sprouting up all over. Chef Joyce de Cuba-Hüsken of Yemanja was one of the first chefs on the island to offer upscale vegan dining. Her menu also features gluten-free, peanut-free, vegetarian and dairy-free options. While omnivores shouldn’t miss her juicy grilled shrimp in Caribbean-Creole sauce, they’d be remiss to overlook the grilled portobello mushrooms stuffed with truffle risotto and the superfood salad with crunchy snow peas, creamy avocado, sweet pomegranate seeds, blueberries and nutty toasted pumpkin seeds in a sweet-and-sour carrot-ginger vinaigrette. Her thoughts are echoed by chefs at Elements, Manchebo Beach Resort & Spa, Así es mi Perú and my new favorite breakfast and lunch spot on the island, Eduardo’s Beach Shack, home of the addictive (and vegan) coconut water ice cream that I want to eat every day of my life. 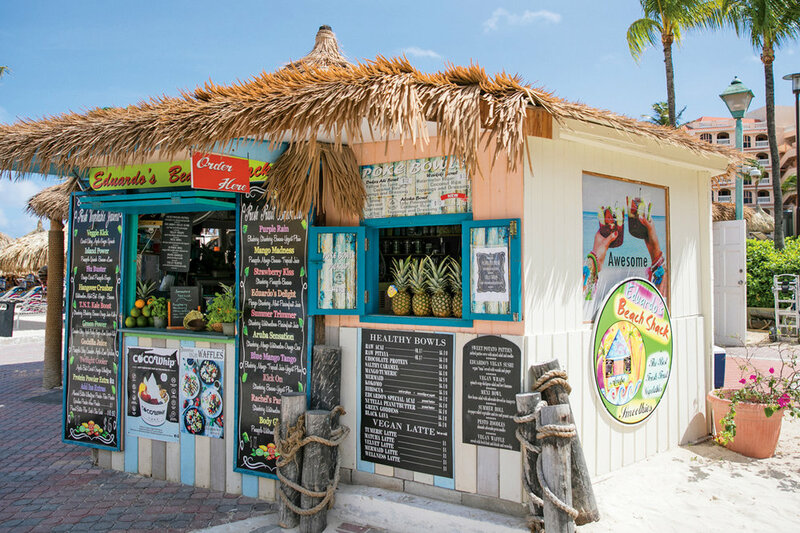 “Trying to get people to have açai bowls thirteen years ago was crazy!” laughs Michelle, the owner of Eduardo’s, who came from Australia and opened the palm-topped hut on Palm Beach behind the Costa Linda Beach Resort. Now, regulars come daily for wheatgrass shots and blue-green Mermaid Bowls of blended açai with pitaya (aka dragon fruit) and spirulina. Thankfully, times have changed. Now, in addition to vegan cuisine, you can find a shop exclusively selling works by local artisans and a Latin dance night that goes beyond reggaeton (think Latin Top 40, e.g. “Despacito” – did you know it was a Latino hit before the remix featuring Justin Bieber exploded?). Whether or not you’re into salsa (either kind), art or vegan cuisine, Aruba will continue to surprise you. This trip, I don’t even mind the sand between my toes that will be hard to evict before my flight home. It may not be encased in a Christmas decoration and wrapped in sparkling ribbons like my discovery at Cosecha, but it still feels like a gift from Aruba – a souvenir from a trip that’s exceeded my expectations. is a Montreal-based food and travel writer.